Jackson Tanner, Mirirai Sithole, and Lisa Bostnar in C.O.A.L. (Confessions of a Liar). Photo by Carol Rosegg. BOTTOM LINE: C.O.A.L. is cold, calculating, and may cause some serious self-reflection. "Lies cover up all the ugly stuff and make it a little easier for people to smile at each other every day," announces one of the four actors playing Coal in David Brian Colbert's confrontational new play. But the small little untruths we tell ourselves and each other to ease the pain of life's mundane struggles pale in comparison to what is at stake on stage. What this play lacks in emotional resonance it more than makes up for in button-pressing subject matter, covering everything from pedophilia, to murder, to suicide. The story is sadly familiar in life and on stage. As Northerners transplanted to a tight-knit mining town in West Virginia, a boy's welfare-dependent family is less than popular with the locals. This prompts the intuitive first grader to fabricate the amount of his allowance as well as his father's profession (claiming he's a pirate). Though the far-fetched lies fail to fly with his outspoken rival or his bible-thumping teacher, the responses make a lasting impression. Cole seems to grasp at a young age what most of us realize much later on, that telling someone what they want to hear is often good enough to get you through, but will leave you empty in the end. As the years go by, his flair for fabrication seeps into every aspect of his life, until the lies are more believable than the actual truth. The production, as directed by Craig Baldwin, is slick, surfacy, and on its toes (like any good liar must be). The pacing is swift, the staging is clean and choreographed, and the dialogue is rapid, slightly robotic, and mostly banal. Because all four actors are on stage throughout, playing the same character (often pausing to recite a superfluous word in unison), the whole thing comes off like a well-rehearsed public service announcement, or as my Grandma used to call everything from Oklahoma to Death of a Salesman, "a presentation." 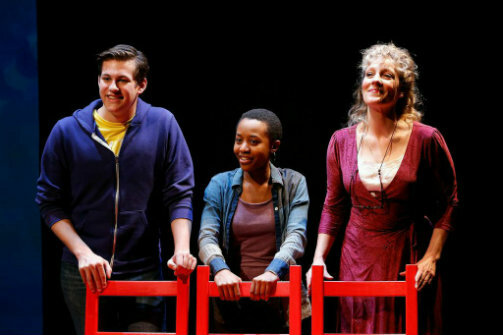 The four actors playing Coal (Lisa Bostnar, Mirirai Sithole, Jackson Tanner, and David Brian Colbert) are all energetic and engaging, but it seems like an odd choice as any one of them would be capable of going it alone. The beautiful projections by Luke Norby, effective lighting design by Cory Pattak, and some well-placed bluegrass courtesy of Dave Rubin, all combine to give C.O.A.L. a slick sheen that adds to the exhibition-like atmosphere.